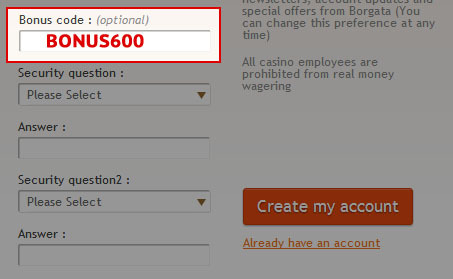 When creating a new account, you should enter the Borgata Poker bonus code BONUS600, as shown below. This will activate your account to receive the 100% up to $600 bonus upon making your first deposit. 1) Visit Borgata Poker using the links on this page. 2) Download the software and create a new account. 3) Verify your account, including your email address and location within New Jersey. 4) Once you successfully signup, you will be credited with $10 in cash, and $10 in bonus funds. The $10 in cash is yours to use immediately however you like. Try your luck in their MTTs/SNGs, or sit down and play some cash. The $10 bonus is very easily released by collecting 40 iRewards Points (iRP) which are described in detail below. Don’t miss out on this Borgata no deposit bonus – it won’t last forever! If the $20 free isn’t enough, or if you’re just looking for even more free cash, Borgata Poker will match any deposit you make, up to $600. Don’t forget the Borgata Poker bonus code BONUS600! Only play during the first 45 days counts towards the bonus – any unearned potion of the bonus after 45 days will expire. To clear this bonus, a player needs to earn iRPs by playing real money poker on the site. The bonus is released in 10% increments at a rate of 4 iRPs per $1, so if you deposited $600 your bonus would be released in $60 segments for 240 iRPs. It takes 2,400 iRPs to clear the full bonus possible ($600). Borgata Poker allows players to earn iRPs at 2iRPs per dollar of rake. This is either for cash tables, or for tournaments. If for example you played a $20 tournament, $18 goes to the prize pool, and $2 goes in rake. You would earn 4 iRPs every time you entered one of these events. The right sidebar shows the approximate number of hands and tournament fees required to clear the full $600 bonus. With a player sitting at $0.25/$0.50 cash tables, it would take approximately 36,365 hands to clear the total $600 bonus, and 3,636 hands to clear each $60 segment. The bonus lasts for 45 days after the first deposit, so a player would need to be able to play an average of 802 hands of $0.25/$0.50 No Limit Hold’em each day to clear the bonus. This is definitely possible, but may be difficult due to the low traffic. However, remember that the bonus is released in increments, so even if you don’t collect the full amount, you will earn something. Also remember the bonus clears faster at higher stakes. When you crunch the numbers, this bonus is pretty solid, coming in at 50% rakeback/cashback. This means you have to pay $1,200 to collect the $600 bonus. This is definitely above the industry standard, so if you can play during peak traffic, it’s worth making a deposit!